10-Oct-2010 -- This report is the third out of a series of four confluences that I visited during an October weekend on a tour from Zurich (Switzerland) to the Region Rhône-Alpes in France and Piermonte in Italy. The story starts from 46°N 6°E. The previous confluence visit is 45°N 6°E. I arrived late in the night in Laux, located 5 km beeline from the confluence point at an altitude of 1370 m. Walking through the foggy, narrow and empty alleys of the village and the traditional lighting gave me a mysterious impression, but the village was positively overwhelming, with its little yards and its fountains at every corner. After spending the night in Laux, I started my hike at 8 a.m. An altitude difference of 1000 m had to be covered. I followed a forestry track upwards through a larch forest. Around an altitude of 1600 m I passed the last farmhouse and here the track turned into a trail, winding up further uphill through the larch forest in lots of twists and turns. Interestingly, the tree line is here extremely high, I passed it around 2100 m altitude. 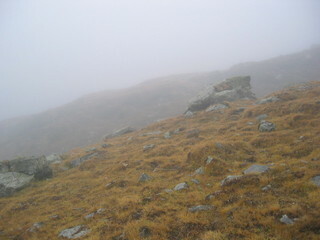 After passing the tree line, the steepness of the trail decreases and the walk is on open grassland. The fog did not resolve as I had expected. The confluence was not sufficiently high in order to be above the clouds. But, confluencing has not the aim to compete in taking the nicest and brightest pictures; it has the aim to document “as it is”. So, this time it was foggy and the views are accordingly short. I reached the confluence at 10:30 am, after a 2.5 hour hike. It is notable, that the confluence is located only 6 m from the official hiking trail (signposted with red-white markers). In the view east the trail can be seen. Also notable is the little larch tree, that can be seen in this image – remember that it grows at an altitude of 2400 m. Besides that tree, the vegetation at the confluence point is mostly grass and moss. The thin layer of soil does not cover the rocks completely. One particular rock marks the confluence point (which is located in this image between the big rock and the cow’s mess). After having my traditional bread and cheese reward, returned back to Laux – with this fog, I didn’t see any point in climbing the peak. Interestingly, I found my water bottle compressed when I unpacked it in Laux – this is due to the higher pressure at the lower altitude. Vegetation: besides one larch, only grass, thin layer of soil, partially uncovered rock face (that is why picture #1 of visit #1 cannot be taken near the CP). Topography: on a slope, high alpine mountain area. Description of the CP: In the Region Piedmont in the very north-east of Italy. Less than 1 km distance to the 3000 m high mountain “Monte Albergian”. Story finished at 45°N 8°E. Altitude source: SRTM 90m digital elevation data.